The beginning chain should be a multiple of 44 plus 14. Row 1: Dc in 5th chain from hook, dc in next 4 ch, 3dc in next ch, dc in next 17 ch, dc3tog (uses 3 ch), dc in next ch, dc3tog, dc in next 17 ch, 3dc in next ch, ** dc in next ch, 3 dc in next ch, dc in next 17 ch, dc3tog (uses 3 ch), dc in next ch, dc3tog, dc in next 17 ch, 3dc in next ch. Repeat from ** across to last 6 chains. Dc in next 6 ch. Turn. Row 2: Ch1, sc in first dc. Sc in each stitch to end of row. Sc in top turning chain. Turn. Row 3: Ch3 (counts as first dc) dc in second sc, dc in next 4 sc, 3dc in next sc, dc in next 17 sc, dc3tog (uses 3 sc), dc in next sc, dc3tog, dc in next 17 sc, 3dc in next sc, ** dc in next sc, 3dc in next sc, dc in next 17 sc, dc3tog (uses 3 sc), dc in next sc, dc3tog, dc in next 17 sc, 3dc in next sc. Repeat from ** across to last 6 sc. Dc in next 6 sc. Turn. Row 4: Ch1, sc in first dc, sc in each of the next 4 dc, dc in next dc, ch3, sc in next dc, (ch3, skip three dc, sc in next dc) four times, ch3, skip four stitches, dc in next dc (this is the dc between the two dc3tog), ch3, skip four stitches, sc in next dc, (ch3, skip three dc, sc in next dc) four times, ch3, dc in next dc, ** ch3, sc in next dc, (ch3, skip three dc, sc in next dc) four times, ch3, skip four stitches, dc in next dc (this is the dc between the two dc3tog), ch3, skip four stitches, sc in next dc, (ch3, skip three dc, sc in next dc) four times, ch3, dc in next dc . Repeat from ** across to last 4 dc and turning chain. Sc in next 4 dc, sc in top of turning chain. Turn. Row 5: Ch3 (counts as first dc) dc in second sc, dc in next 3 sc, 2dc in next dc, (sc in next ch sp, 3dc in next sc) five times, sc in next ch sp, ** 3dc in next dc, (sc in next ch sp, 3dc in next sc) five times, sc in next ch sp . Repeat from ** across to last dc and 5 sc. 2dc in next dc, dc in each of the next 5 sc. Turn. Row 6: Ch1, sc in first dc, sc in each of the next 4 dc, ch2, skip one dc, sc in next dc, (ch3, sc in center dc of next shell) five times, skip a shell, (ch3, sc in center dc of next shell) five times, ** ch3, sc in first dc of next shell, ch3, sc in third dc of same shell, (ch3, sc in center dc of next shell) five times, skip a shell, (ch3, sc in center dc of next shell) five times. Repeat from ** across to last 6 dc and turning chain. Ch3, sc in first dc after last shell, ch2, skip one dc, sc in next 4 dc, sc in top of turning chain. Turn. Row 7: Ch3 (counts as first dc) dc in second sc, dc in next 3 sc, sc in next ch sp ** 3dc in next sc, sc in next ch sp. Repeat from ** across to last 5 sc. Dc in each of the next 5 sc. Turn. Row 8: Ch1, sc in first dc, sc in each of the next 4 dc, dc in next sc, ** (ch3, sc in center dc of next shell) five times, ch3, skip a shell, dc in next sc, skip a shell, (ch3, sc in center dc of next shell) five times, ch3, dc in next sc. Repeat from ** across to last 4 dc and turning chain. Sc in next 4 dc, sc in top of turning chain. Turn. Repeat rows 5 through 8 until afghan is desired length. End with a row 8 then complete the next three rows. Third to last row: Ch3 (counts as first dc) dc in second sc, dc in next 4 stitches, 3dc in next stitch, dc in next 17 stitches, skip next chain and sc, dc3tog (uses 3 stitches), dc in next stitch, dc3tog, skip next sc and ch, dc in next 17 stitches, 3dc in next stitch, ** dc in next stitch, 3dc in next stitch, dc in next 17 stitches, skip next ch and sc, dc3tog (uses 3 stitches), dc in next stitch, dc3tog, skip next sc and ch, dc in next 17 stitches, 3dc in next stitch. Repeat from ** across to last 6 stitches. Dc in next 6 stitches. Turn. Next to last row: Ch1, sc in first dc. Sc in each stitch to end of row. Sc in top turning chain. Turn. Last row: Ch3 (counts as first dc) dc in second sc, dc in next 4 sc, 3dc in next sc, dc in next 17 sc, dc3tog (uses 3 sc), dc in next sc, dc3tog, dc in next 17 sc, 3dc in next sc, ** dc in next sc, 3dc in next sc, dc in next 17 sc, dc3tog (uses 3 sc), dc in next sc, dc3tog, dc in next 17 sc, 3dc in next sc. Repeat from ** across to last 6 sc. Dc in next 6 sc. Finish off and weave in end. WOW this is so nice. I adore the little shells. I am trying to crochet the Little Shell Ripple Afghan and it just isn’t working out starting with row 5. I have done row 4 four times and row 5 just doesn’t work out. Row 5 is saying to stitch in double crochets where there aren’t any double crochets. Could you please let me know if there is a mistake in the directions. 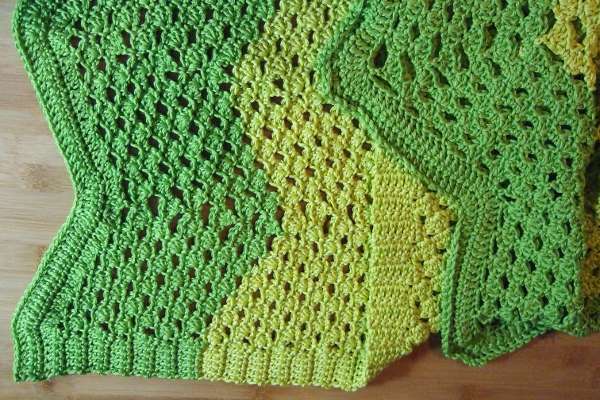 I would really love to be able to make this afghan. It is so beautiful. Thank you for your help with this problem. Do you like charts? If so, I can try charting it and see if that helps. Going back to map it out I did find a couple of errors in row 4. That was probably the entire problem. I had left out a couple of ch3’s after a couple of the dc’s. I am so sorry that you have been trying this over and over with my errors. I completely see why row 5 wouldn’t work with those missing ch3’s in row 4. Have you fixed the pattern to include the ch3’s after the couple of dc’s? I want to try this pattern very much! Have a great weekend and thanks for sharing. Yes. It is current with all raised issues addressed. As there appears to be a problem with row 4 will you be posting the corrected pattern? I would also be interested in a chart of the pattern. There was a problem with row 4 when I initially posted the pattern, but it is corrected now. Love your pattern !!! Thank you so much for sharing it. Only “disappointment” was ~~ when I printed out the pattern and the chart, the ONLY location identifying it as yours with the web site, was on the first page. To make muti-page patterns easier to keep together and identify, I like your name and web site location on each page. I didn’t know that wasn’t printing on subsequent pages. Thanks for letting me know. I’ll alert my webmaster (husband). Does the pattern include the border? I am confused as it looks as if the dc3tog starts right off, but the border looks like plain dc to me. It does include the border. The border is mostly dc but has to include decreases and increases to make it ripple. i see this with double varigated: one in green-khaki colors and the other in spring green colors…. i love that combo! thanks for giving me so many lovely patterns to choose from for the Warmth For All collections! the kids and homeless will love these! Repeat from ** across to last 4 dc and turning chain. Sc in next 4 dc, sc in top of turning chain. Turn. The skipped shells are in the “valleys”. The end of the row ends on a “peak”. You will have a sc in the top of the shell right before the edge, a ch 3, a dc in the sc that is next to the edge then sc in the 4 dc and turning chain at the edge. It should work as it is written. Thanks, Mama. I love the pattern. This is the part that is missing in the instructions: a ch 3, a dc in the sc that is next to the edge then sc in the 4 dc and turning chain at the edge. The instructions only take us to the “peak” and then skips to the edge. Mama, I apologize, I found I have an extra shell. I am going to start over. You’re wonderful! Thanks so much for giving the various sizes of afghans. I crochet afghans for the needy and homeless vets, people whose homes have burned to the ground, etc. Your afghans are easy and very lovely. I make my afghans as “gifts” to those in need and your afghans fit the bill. Thank you so much for sharing. I’ve copied several more patterns. Again, thanks so much for giving me the choice of size, without having to do the math myself! They are now correct and have been used successfully many times now. Tell me what is happening so that I can help figure it out. I corrected the original problem which was that the end of the row directions were completely missing. I followed the directions as though I’d never made the pattern and made it through row 5 fine, so I haven’t found a problem. Could you give me some more details of what is happening? How can we copy the pattern without copying all the comments! Love them! If you click the printer icon at the top of the icon, it will give you a clean copy to print, copy or save as a pdf. I want to make “Little Shell Ripple afghan’. I notice in the picture there are stitches that make you think it will have a border around the work. I cannot fine, in the pattern, where these stitches are listed. Would explain this for me. All the borders are included in the directions. The border is included as you go. The first three rows form the bottom border, the last three rows given at the end of the pattern form the top border, and the side edgings are included in each row directions. A beautiful afghan! I’m a bit confused. When it says Dc3tog, dc, where do you insert hook for the dc? Is it in the same stitch as the 3rd stitch in the dc3tog? I’m fairly new to crochet and can’t seem to figure this out. Thank you. The Dc3tog uses three stitches that aren’t used for any other stitches, so the next dc would go in the next stitch. Mama, I am trying this again. Now I am at the end and ready to finish the afghan, I am trying to do third to the last row. I have all those chains in row 8, which don’t seem to recognized in third to last row. Am I missing something?. Instead of spelling out if the dc were being made in ch or sc stitches, I just said “stitches”. All those chains count as individual stitches that you will make dc into. me encanta este trabajo, pero me resulta muy dificil de seguir, por favor tendrias esquema del mismo? Just started your afghan after a long break from crocheting. Can you tell how many sc you should end up with after row 2? You should have 4 less sc than the number of beginning chains you started with. I’m so sorry I has taken me so long to respond. The peaks and valleys on this blanket are different than the standard ripple. In the borders the peaks are actually over three stitches, two sets of 3 dc separated by a single dc. The valleys are similar, two 3dctog separated by a single dc. This makes the peaks and valleys a little more rounded rather than being sharp points. Hi! This is a lovely pattern Thank you very much for sharing. However, I couldn’t understand how to change color. I’m new to crocheting, maybe that’s why, but could you help me with that? Here is a video on basic color changing. Color changes in this pattern would be done with the basic color changing technique. I personally knot my ends before crocheting over them, but that is my personal preference. I definitely want to make this pattern. The best part about it is that if one has a problem, you provide feedback and help. I like that. Thanks.